Estate Planning is one of the more challenging aspects of Financial Planning - for a variety of reasons. It involves multiple professionals (Attorney, Accountant, and Financial Planner), requires Clients to consider their own mortality, and demands specific answers to exceptionally difficult questions. All of that said, Estate Planning remains essential and while the demands are many, arriving at a cogent Estate Plan is not an insuperable task. You may have heard differing opinions regarding the necessity of having a Will or other Estate Documents...opinions vary from "don't worry about it" to "Everyone needs a Will". In my world, if there is any doubt, there is no doubt. Therefore, I recommend to ALL Clients (and non-Client Adults) talk to a licensed Estate Planning Attorney about their specific needs. Most people likely won't require several binders of complex legal documents; however, there are usually at least a few documents you ought to have, which I wrote about previously here. 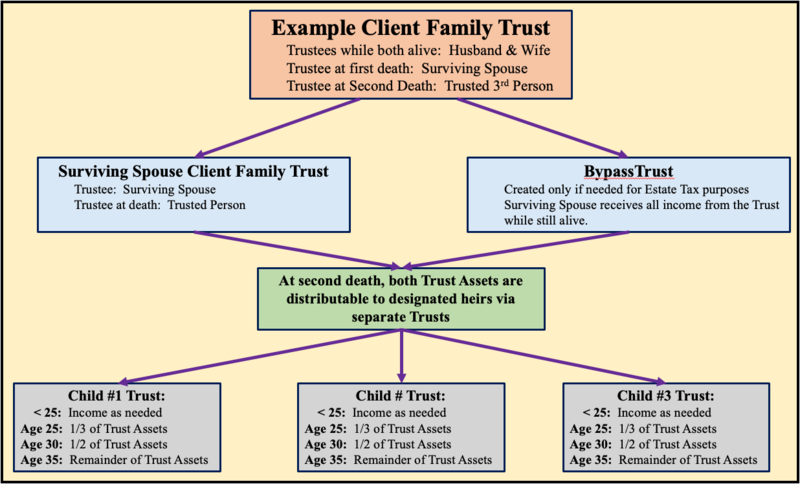 For this article, I will illustrate a practical, real-world example of a family who completely reconstructed their Estate Plan from end-to-end. I will also detail the timeline required to complete the drill and discuss some of the considerations. Finally and most importantly, after reading this, you should understand that Estate Planning need not be akin to having your fingernails forcibly yanked out. Rather, it can be a Life Planning experience where you arrange for many pleasant outcomes. None of the children have special needs, the parents are both in excellent health, and all the children still live at home. Financially, the family has significant retirement account assets, ample liquidity, College Savings Accounts, and negligible debt. After an initial Client Meeting, the Example Family signed-on to become Clients of Resilient Asset Management. Upon reviewing their financial situation, Resilient quickly determined their Estate Plan needed attention. Specifically, their only Estate Documents were Wills that were essentially mirror images of each other. Meaning, if the Husband or Wife died, the Surviving Spouse was the beneficiary. There were no other documents. 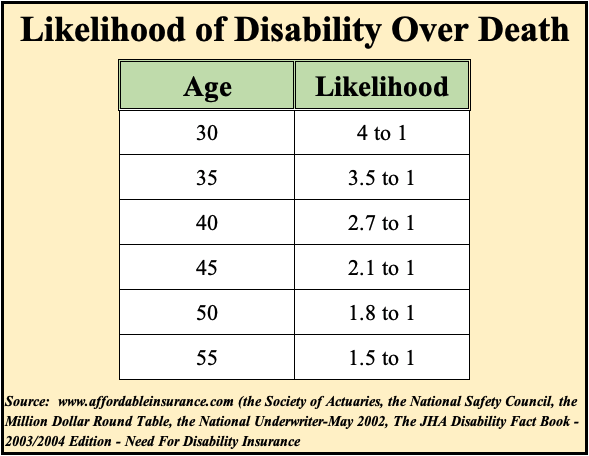 Leaving aside Disability Coverage (Separate Topic), the need for a Power of Attorney is great for everyone...life goes on - mortgage payments, car payments, tuition payments - regardless of your circumstances. Military members are all too familiar with this concept while deployed. A Power of Attorney makes the handling of your financial affairs by someone else possible. Health Care Power of Attorney. For the same reasons stated above, this document is also essential. As the name implies, this document nominates someone to make health care decisions on your behalf. Revocable Living Trust. Trusts can be complex beasts, though they need not be in every situation. For the Example Family's situation, especially with Minor Children, a Revocable Living Trust was a possibility. 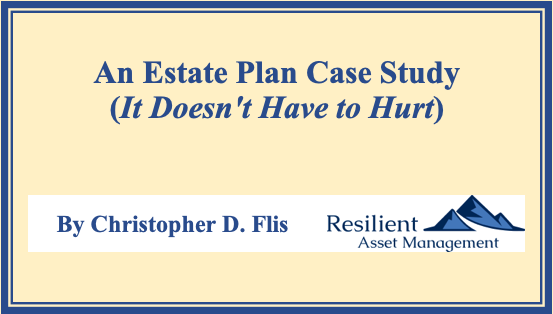 After providing some basic academic background, Resilient Asset Management asked that the Clients speak to their Estate Attorney about this option. As far as legal endeavors go, Estate Planning is comparatively "fun". Typically, you are not dealing with an adversary...you are planning for your own affairs. Moreover, Estate Planning Attorneys are a fun group, this it is pretty easy to ask friends and family for a referral. In this particular case, the Example Family had their own attorney, so they went with who they already knew. After about 3 weeks after onboarding, the Clients met with their Estate Attorney. In preparation for their meeting, Resilient Asset Management contacted their Attorney for a quick introduction and established a Secure, On-Line Folder through which we could exchange documents and other sensitive information. Selection of a Guardian. Undoubtedly, one of the most difficult choices a parent can make is who will care for their children in the event of both parent's passing. Who will make decisions. Another difficult choice is who you will trust to make decisions - both financial and health care-related - for you. The actual Power of Attorney documents are pretty straight-forward. Filling in the blanks for the names, not so much. For married folks, the first choice is simple, usually your spouse. The contingent is perhaps a bit more difficult. How and When will Minor Children Receive an Inheritance. Another sticky issue. In the vast majority of cases, at least one parent will live to see their children become adults. However, for Estate Planning, you do have to decide how and when children will receive perhaps windfall amounts of money. After about 2 weeks, the Estate Attorney provided complete DRAFTs of all the Clients' Estate Documents. The Clients had sifted through all the various scenarios and made selections for their Key Estate Personnel (Guardians, Trustees, etc.). Moreover, they documented their respective end-of-life medical choices. After approximately two additional weeks, the Clients signed the Estate Documents at their Attorney's office. To be exact, they signed their paper 3 months and 3 days after becoming Resilient Asset Management Clients. Practically speaking, I estimate they spent a total of 7-10 of those days contemplating Estate Planning issues - and only an hour or less each of those days. Revocable. With this type of Trust, you are free to make as many changes as you would like - it is just that, Revocable. Bypass Trust. Presently, the Estate Tax limit is set very high - in excess of $10 million per person. Few estates reach this level. Therefore, the Bypass Trust as depicted above has been rendered relatively unused by most. However, laws can change; therefore, it is wise to have a flexible plan to account for such potentialities as the Estate Tax changing. Moreover, it is prudent to review your Estate Plan regularly to ensure it is adequate for the current laws. Probate. For whatever you may have read or heard about Probate Court, generally speaking, it is best avoided. One of the happy outcomes of Estate Planning is that if it is done properly, you pass along the luxury of your heirs staying out of Probate Court. Your Estate Attorney can further explain how this is done and why it might be advisable. Minors. Under present law, Minors cannot inherit property. Therefore, in the absence of a Trust, several somewhat difficult hoops have to be jumped through to provide for minor children. Therefore, establishing a Revocable Living Trust now, even with a relatively small estate, might be advisable. Trusts are a potentially great landing spot for insurance payouts earmarked to provide for Minors. Deed real estate to the Trust. This is accomplished by "quit claiming" your property to your Trust...your attorney can assist with this process. Re-titling accounts. Once you have established a Trust, you are free to open accounts at financial institutions in the Trust's name. To do so, you typically need to provide a copy of the Trust Certificate, which your Attorney will provide to you at signing. Transfer on Death Designations. If you choose to keep your existing accounts, you can simply complete a Transfer on Death Form, where you can name your Trust as the Beneficiary. Changing Beneficiary Designations. For most couples, spouses name each other as Primary Beneficiaries. For Contingent Beneficiaries, your attorney is likely to recommend naming your Trust as the beneficiary. This is easily accomplished via Change of Beneficiary forms, which are available for any account requiring a beneficiary. For as much information as there may be in this article, if I had to pass on one bit of advice, it deals with adult children. Upon reaching Age 18, most people are considered adults. For parents, this age represents a sea change in handling your children's affairs - either medical or financial. Therefore, when you speak to an Estate Attorney, please be sure to mention if you have adult children. Your attorney can assess the situation and prepare the necessary documents to allow for you to care for your children is an unfortunate accident occurs. There you have it. In all, the process took about 3 months. Some people move faster, some slower...it is not such a big deal so long as it gets done. The important thing is to keep the momentum going once you get started and to have your professionals working in the background while you are living your best (probably busy) life. If you have any questions or comments, please leave them here. It is always a pleasure to hear feedback on our articles.